Martti Oiva Kalevi Ahtisaari ([mɑrtːi oiʋɑ kɑleʋi ɑhtisɑːri] ( listen) born 23 June 1937 in Viipuri) is a Finnish politician, the tenth President of Finland (1994–2000), a Nobel Peace Prize laureate, and a United Nations diplomat and mediator noted for his international peace work. Ahtisaari was a United Nations special envoy for Kosovo, charged with organizing the Kosovo status process negotiations, aimed at resolving a long-running dispute in Kosovo, which later declared its independence from Serbia in 2008. In October 2008, he was awarded the Nobel Peace Prize "for his important efforts, on several continents and over more than three decades, to resolve international conflicts". The Nobel statement said that Ahtisaari has played a prominent role in resolving serious and long-lasting conflicts, including ones in Namibia, Aceh (Indonesia), Kosovo, and Iraq. Martti Ahtisaari was born in Viipuri, Finland (now Vyborg, Russia). His father, Oiva Ahtisaari (whose grandfather Julius Marenius Adolfsen had emigrated with his parents to Finland in 1872 from Tistedalen in Southern Norway) took Finnish citizenship in 1929 and Finnicized his surname from Adolfsen in 1936. The Continuation War (World War II) took Martti's father to the front as an NCO army mechanic, while his mother, Tyyne, moved to Kuopio with her son to escape immediate danger from the war. Kuopio was where Ahtisaari spent most of his childhood, eventually attending the Kuopion Lyseo high school. In 1952, Martti Ahtisaari moved to Oulu with his family to seek employment. There he continued his education in high school, graduating in 1952. He also joined the local YMCA. After completing his military service (Ahtisaari holds the rank of captain in the Finnish Army Reserve), he began to study through a distance-learning course at Oulu teachers' college. He was able to live at home while attending the two-year course which enabled him to qualify as a primary-school teacher in 1959. Besides his native language, Finnish, Ahtisaari speaks Swedish, French, English, and German. In 1960, he moved to Karachi, Pakistan, to lead the Swedish Pakistani Institute's physical education training establishment, where he became accustomed to a more international environment. In addition to managing the students' home, Ahtisaari's job involved training teachers. He returned to Finland in 1963, and became active in non-governmental organizations responsible for aid to developing countries. He joined the international students' organisation AIESEC, where he discovered new passions about diversity and diplomacy. In 1965, he joined the Ministry for Foreign Affairs in its Bureau for International Development Aid, eventually becoming the assistant head of the department. In 1968, he married Eeva Irmeli Hyvärinen (b. 1936). The couple has one son, Marko Ahtisaari, a technology entrepreneur and musician. Ahtisaari spent several years as a diplomatic representative from Finland. He served as Finland's Ambassador to Tanzania from 1973 to 1977. As UN Deputy Secretary-General 1977–1981 and as United Nations Commissioner for Namibia from 1976 to 1981, working to secure the independence of Namibia from the Republic of South Africa. Between 1982–1983 Ahtisaari was the Under-Secretary-General of the United Nations. Following the death of a later UN Commissioner for Namibia, Bernt Carlsson, on Pan Am Flight 103 on 21 December 1988 – on the eve of the signing of the Tripartite Accord at UN Headquarters – Ahtisaari was sent to Namibia in April 1989 as the UN Special Representative to head the United Nations Transition Assistance Group (UNTAG). Because of the illegal incursion of SWAPO troops from Angola, the South African appointed Administrator-General (AG), Louis Pienaar, sought Ahtisaari's agreement to the deployment of SADF troops to stabilize the situation. Ahtisaari took advice from British prime minister Margaret Thatcher, who was visiting the region at the time, and approved the SADF deployment. A period of intense fighting ensued when at least 375 SWAPO insurgents were killed. In July 1989, Glenys Kinnock and Tessa Blackstone of the British Council of Churches visited Namibia and reported: "There is a widespread feeling that too many concessions were made to South African personnel and preferences and that Martti Ahtisaari was not forceful enough in his dealings with the South Africans." Perhaps because of his reluctance to authorise this SADF deployment, Ahtisaari was alleged to have been targeted by the South African Civil Cooperation Bureau (CCB). According to a hearing in September 2000 of the South African Truth and Reconciliation Commission, two CCB operatives (Kobus le Roux and Ferdinand Barnard) were tasked not to kill Ahtisaari, but to give him "a good hiding". To carry out the assault, Barnard had planned to use the grip handle of a metal saw as a knuckleduster. In the event, Ahtisaari did not attend the meeting at the Keetmanshoop Hotel, where Le Roux and Barnard lay in wait for him, and thus Ahtisaari escaped injury. After the independence elections of 1989, Ahtisaari was appointed an honorary Namibian citizen. South Africa gave him the O R Tambo award for "his outstanding achievement as a diplomat and commitment to the cause of freedom in Africa and peace in the world". Ahtisaari served as UN undersecretary general for administration and management from 1987 to 1991 causing mixed feelings inside the organisation during an internal investigation of massive fraud. When Ahtisaari revealed in 1990 that he had secretly lengthened the grace period allowing UN officials to return misappropriated taxpayer money from the original three months to three years, the investigators were furious. The 340 officials found guilty of fraud were able to return money even after their crime had been proven. The harshest punishment was the firing of twenty corrupt officials. Ahtisaari's presidential campaign in Finland began when he was still a member of the council dealing with Bosnia. Finland's ongoing recession caused established political figures to lose public support, and the presidential elections were now direct, instead of being conducted through an electoral college. In 1993, Ahtisaari accepted the candidacy of the Social Democratic Party. His politically untarnished image was a major factor in the election, as was his vision of Finland as an active participant in international affairs. Ahtisaari narrowly won over his second round opponent, Elisabeth Rehn of the Swedish People's Party. During the campaign, there were rumours spread by some political opponents of Ahtisaari that he had a drinking problem or that he had knowingly accepted a double salary from the Finnish Foreign Ministry and from the United Nations while trying to negotiate an end to the Bosnian War. Ahtisaari denied both allegations and no firm proof of them has emerged. During the three-week campaign between the two rounds of presidential elections, Ahtisaari was praised by his supporters for being more compassionate towards the many unemployed Finns than Rehn, who as Defence Minister had to officially support the Aho government's strict economic policies. A minor controversy arose during a town hall-style presidential debate in Lappeenranta, southeastern Finland, when an apparently born-again Christian woman in the audience asked Rehn what her relationship with Jesus was. Rehn replied that she had personally no proof that Jesus had been a historical person. Ahtisaari ducked a precise answer by stating that he trusted the Lutheran confession even on this issue. His term as president began with a schism within the Centre Party government led by prime minister Esko Aho, who did not approve of Ahtisaari's being actively involved in foreign policy. There was also some controversy over Ahtisaari's speaking out on domestic issues such as unemployment. He travelled extensively in Finland and abroad, and was nicknamed "Matka-Mara" ("Travel-Mara," Mara being a common diminutive form of Martti). His monthly travels throughout the country and his meetings with ordinary citizens (the so-called maakuntamatkat or "provincial trips") nonetheless greatly enhanced his political popularity. Ahtisaari kept his campaign promise to visit one Finnish historical province every month during his presidency. He also donated some thousands of Finnish marks per month to the unemployed people's organisations, and a few thousand Finnish marks to the Christian social organisation of the late lay preacher and social worker Veikko Hursti. Ahtisaari favoured pluralism and religious tolerance publicly. Privately, he and his wife practise their Christian faith. Contrary to some of his predecessors and his successor as the Finnish President, Ahtisaari ended all of his New Year's speeches by wishing the Finnish people God's blessing. In January 1998 Ahtisaari was criticized by some NGOs, politicians and notable cultural figures because he awarded medals of honour to the Forest Minister of Indonesia and to the main owner of the Indonesian RGM Company, a parent company of the April Company. The April Company was criticized by non-governmental organisations for destroying rain forests, and Indonesia itself was criticized heavily for human right violations, especially in East Timor. Ahtisaari's party chairman Erkki Tuomioja said that giving medals was questionable since he feared the act may tarnish the public image of Finnish human rights policy. Students of the arts had demonstrations in Helsinki against the decision to give medals. President Ahtisaari supported Finland's entry into the European Union, and in a 1994 referendum, 57 percent of Finnish voters were in favour of EU membership. He later stated that if Finland had not voted to join the EU he would have resigned. During Ahtisaari's term as president, Boris Yeltsin and Bill Clinton met in Helsinki. He also negotiated alongside Viktor Chernomyrdin with Slobodan Milošević to end the fighting in the Yugoslav province of Kosovo in 1999. Often encountering resistance from the Finnish parliament, which preferred a more cautious foreign policy, as well as from within his own party, Ahtisaari did not seek re-election in 2000. He wanted the Social Democrats to re-nominate him for the presidency without opposition, but two opponents signed up for the party's presidential primary. Ahtisaari was the last "strong president", before the 2000 constitution reduced the president's powers. He was succeeded by the foreign minister Tarja Halonen. In Finnish politics, Ahtisaari has stressed how important it is for Finland to join NATO. Ahtisaari has argued that Finland should be a full member of NATO and the EU in order "to shrug off once and for all the burden of Finlandization". He believes politicians should file application and make Finland a member. He says that the way Finnish politicians avoid expressing their opinion is disturbing. He has noted that the so-called "NATO option" (acquiring membership when Finland is threatened) is an illusion, making an analogy to trying to obtain fire insurance when the fire has already started. Since leaving office, Ahtisaari has held positions in various international organisations. In 2000, he became Chairman of the Brussels-based International Crisis Group, an NGO to which he committed $100,000 in government funding in 1994 one month after becoming elected President of Finland. He remains Chairman Emeritus. Ahtisaari also founded the independent Crisis Management Initiative (CMI) with the goal of developing and sustaining peace in troubled areas. On 1 December 2000, Ahtisaari was awarded the J. William Fulbright Prize for International Understanding by the Fulbright Association in recognition of his work as peacemaker in some of the world's most troubled areas. In May 2017 Ahtisaari suggested as new CMI leader Alexander Stubb a Finnish politician representing Finnish concervatives i.e. the National Coalition Party. In 2000–01, Ahtisaari and Cyril Ramaphosa inspected IRA weapons dumps for the Independent International Commission on Decommissioning, as part of the Northern Ireland peace process. In 2005, Ahtisaari successfully led peace negotiations between the Free Aceh Movement (GAM) and the Indonesian government through his non-governmental organization CMI. The negotiations ended on 15 August 2005 with the signing of the Helsinki MOU on disarmament of GAM rebels, the dropping of GAM demands for an independent Aceh, and a withdrawal of Indonesian forces. In November 2005, UN Secretary-General Kofi Annan appointed Ahtisaari as Special Envoy for the Kosovo status process which was to determine whether Kosovo, having been administered by the United Nations since 1999, should become independent or remain a province of Serbia. In early 2006, Ahtisaari opened the UN Office of the Special Envoy for Kosovo (UNOSEK) in Vienna, Austria, from where he conducted the Kosovo status negotiations. Those opposed to Ahtisaari's settlement proposal, which involved an internationally monitored independence for Kosovo, sought to discredit him. Allegations made by Balkan media sources of corruption and improper conduct by Ahtisaari were described by US State Department spokesman Tom Casey as "spurious", adding that Ahtisaari's plan is the "best solution possible" and has the "full endorsement of the United States". The New York Times suggested that this criticism of Ahtisaari on the part of the Serbs had led to the "bogging down" of the Kosovo status talks. In November 2008, Serbian media reported Pierre Mirel, director of the EU enlargement commission's western Balkans division as saying: "The EU has accepted that the deployment of EULEX has to be approved by the United Nations Security Council, and that the mission has to be neutral and will not be related to the Ahtisaari plan," Mirel said, following his meeting with Serbia's vice-president Bozidar Djelic. In July 2007, however, when the EU, Russia and the United States agreed to find a new format for the talks, Ahtisaari announced that he regarded his mission as over. Since neither the UN nor the troika had asked him to continue mediations in the face of Russia's persistent refusal to support independence for Kosovo, he said he would nonetheless be willing to take on "a role as consultant", if requested. After a period of uncertainty and mounting tension, Kosovo unilaterally declared its independence from Serbia in February 2008. In his work, he has emphasised the importance of the United States in the peace process, stating that "There can be no peace without America." 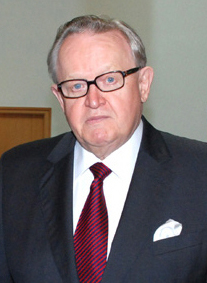 Ahtisaari was chairman of the Interpeace Governing Council from 2000 to 2009. Since 2009, Ahtisaari has been Chairman Emeritus and a Special Advisor. Ahtisaari is board director of the ImagineNations Group. In 2008 Ahtisaari was awarded an honorary degree by University College, London. That same year he received the 2007 UNESCO Félix Houphouët-Boigny Peace Prize, for "his lifetime contribution to world peace". In September 2009 Ahtisaari joined The Elders, a group of independent global leaders who work together on peace and human rights issues. He travelled to the Korean Peninsula with fellow Elders Gro Harlem Brundtland, Jimmy Carter and Mary Robinson in April 2011, and to South Sudan with Robinson and Archbishop Desmond Tutu in July 2012. Ahtisaari is a member of the Mo Ibrahim Foundation's Ibrahim Prize Committee. He is also a member of the board of the European Council on Foreign Relations. In August 2012, Ahtisaari opined on the sectarian violence in Syria and was mentioned as a possible replacement as Joint Envoy there to succeed former Secretary-General Kofi Annan. However, Ahtisaari then told the Finnish state broadcaster YLE that "he wished the mission would fall on someone else" which it ultimately did in the person of Lakhdar Brahimi, a former Algerian foreign minister and longtime U.N. diplomat. In late 2015, Martti Ahtisaari reiterated charges he already had made in an interview with German broadcaster Deutsche Welle in early 2013 against members of the UN security council on the obstruction of a political solution to the escalating conflict in Syria. Ahtisaari said in an interview in September 2015 that he held talks about Syria with envoys from the five permanent members of the UN security council in February 2012. According to Ahtisaari, Vitaly Churkin, Russian ambassador to the United Nations, laid out three points during a meeting with him, which included not arming the Syrian opposition, commencing talks between Syrian president Assad and the opposition and finding "an elegant way for Assad to step aside." But the US, Britain and France subsequently ignored the proposal. Ahtisaari said in the interview: "Nothing happened because I think all these, and many others, were convinced that Assad would be thrown out of office in a few weeks so there was no need to do anything." On 10 October 2008 Ahtisaari was announced as that year's recipient of the Nobel Peace Prize. Ahtisaari received the prize on 10 December 2008 at Oslo City Hall in Norway. Ahtisaari twice worked to find a solution in Kosovo – first in 1999 and again between 2005 and 2007. He also worked with others this year to find a peaceful solution to the problems in Iraq, the Committee said. According to the Committee, Ahtisaari and his group, Crisis Management Initiative (CMI), also contributed to resolving other conflicts in Northern Ireland, Central Asia, and the Horn of Africa. Ahtisaari invited Prime Minister Matti Vanhanen, Foreign Affairs Minister Alexander Stubb and others to his Nobel event, but not President Halonen. According to the memoir of the former secretary of the Norwegian Nobel Committee, Geir Lundestad, former Foreign Minister and UN ambassador Keijo Korhonen, who was strongly against awarding the 2008 Nobel Peace Prize to Ahtisaari, wrote a letter to the committee which negatively portrayed Ahtisaari as a person and his merits in international conflict zones. ^ "The Nobel Peace Prize 2008". ^ a b "Ahtisaari, Tuomioja, Haavisto weigh in on Syria", yle.fi, 3 August 2012. Retrieved 2012-08-05. ^ Bryant, Lisa (10 October 2008). "Former Finnish President Martti Ahtisaari Wins Nobel Peace Prize". Voice of America. Archived from the original on 17 November 2008. Retrieved 27 December 2008. ^ President Ahtisaari's ancestors Archived 3 April 2015 at the Wayback Machine a study by Suomen Sukututkimusseura (the Finnish genealogy society). ^ "History of the Embassy of Finland, Dar es Salaam". Embassy of Finland, Dar es Salaam. Retrieved 26 June 2016. ^ Glenys Kinnock (1990). Namibia: Birth of a Nation. Quartet Books Ltd. p. 19. ^ "On Resumption: 28th September 2000 - Day 17". ^ Sainio, Pentti: Operaatio Ahtisaari. Art House, 1993. ^ The Independent On Sunday, 1991 May 19. ^ Mitä Missä Milloin — Kansalaisen vuosikirja 1995 ("What Where When — Citizen's Yearbook 1995"), Helsinki: Otava Publications Ltd., 1994. ^ Anja Snellman and Saska Saarikoski, "The Third Round" / Kolmas kierros, published in Finland in 1994. ^ Pertti Sainio, "Secret Operation Ahtisaari" / Operaatio Salainen Ahtisaari, published in Finland in 1993. ^ Veikko Hursti, "For I Was Hungry ..." / Sillä minun oli nälkä ... (autobiography), published in Finland in 1997. ^ Helsingin Sanomat, kotimaa, 1998 January 15, p. 1, "Mielenosoitus: Kunniamerkit takaisin Indonesiasta". ^ Helsingin Sanomat, Talous, 2000 March 21, p. 3., "Ahtisaari saanee vastaehdokkaan UPM:n hallitus-vaaliin" (tässä jutussa on vain Luontoliiton osuus). ^ Mitä Missä Milloin — Kansalaisen vuosikirja 1996 ("What Where When — Citizen's Yearbook 1996"), Helsinki: Otava Publications Ltd., 1995. ^ "President would have resigned if Finland had vetoed EU membership". Yle Uutiset. ^ Mitä Missä Milloin — Kansalaisen vuosikirja 2000 ("What Where When — Citizen's Yearbook 2000"), Helsinki: Otava Publications Ltd., 1999. ^ "Presidentti Martti Ahtisaari 23.11.2007: Nato-optio on illuusio". ^ Barbara Crossette (1 December 2008). "Peace Prize Comes With Criticism". The Nation. Retrieved 5 April 2019. After his term as president of Finland ended in 2000, Ahtisaari became board chairman of the International Crisis Group, an independent analysis and advocacy organization based in Brussels. ^ "Reports of the Weapons Inspectors". Reports and Statements by the Independent International Commission on Decommissioning (IICD). CAIN. Retrieved 11 October 2008. ^ The New York Times – Serbs Criticize UN Mediator, Further Bogging Down Kosovo Talks Archived 4 January 2016 at the Wayback Machine. ^ "EU accepts Belgrade's conditions for EULEX". Sofia Echo. 7 November 2008. Retrieved 7 November 2008. ^ "Contact Group Meets on Kosovo′s Future as Tensions Rise - Europe - DW.COM - 25.07.2007". DW.COM. ^ Cord, David J. (2012). Mohamed 2.0. Helsingfors: Schildts & Söderströms. p. 156. ISBN 978-951-52-2898-7. ^ "Martti Ahtisaari joins The Elders". TheElders.org. 21 September 2009. Retrieved 6 March 2013. ^ "Carter, 3 other ex-leaders to push for renewed Koreas talks". CNN.com. 27 April 2011. Retrieved 6 March 2013. ^ "The Elders visit South Sudan in sombre mood and urge continued dialogue with Khartoum". TheElders.org. 6 July 2012. Archived from the original on 18 November 2018. Retrieved 6 March 2013. ^ "European Council on Foreign Relations". ^ "General Assembly adopts Resolution on Syria", transcript of UK Ambassador Sir Mark Lyall Grant’s remarks at the 'stakeout' after adoption of the resolution, British UN Mission website, 3 August 2012. Ahtisaari's name only mentioned in a media question. No comment from Grant. Retrieved 2012-08-03. ^ "‘Crazy’ Enough to Take on Syria?" Archived 11 June 2015 at the Wayback Machine, The New York Times, 3 August 2012. Posted 2012-08-03. ^ "Ahtisaari Syyria-tehtävästä: Toivoisin, että se menisi jonnekin muualle". YLE Uutiset (in Finnish). 8 August 2012. Retrieved 11 August 2012. ^ "UN: Algeria’s Brahimi will replace Annan in Syria", AP via New York Daily News, 17 August 2012. Retrieved 2012-08-23. ^ "Ahtisaari finally wins his own Nobel Peace Prize". Aftenposten. 10 October 2008. Archived from the original on 13 October 2008. Retrieved 13 October 2008. ^ "Nobel Peace Prize goes to peace broker Ahtisaari". Aftenposten. 10 October 2008. Archived from the original on 10 October 2008. Retrieved 13 October 2008. ^ "Norjalaiskirja paljastaa: Keijo Korhonen yritti estää Martti Ahtisaaren Nobel-palkinnon". Verkkouutiset. Retrieved 18 September 2015. ^ "Presiden Anugerahkan Bintang Utama Kepada Ahtisaari". Archived from the original on 4 April 2015. ^ "TKK Honorary Doctor Martti Ahtisaari to receive Nobel Peace Prize"[permanent dead link], Aalto University webpage, 13.10.2008. AU is successor to HUT/TKK. Retrieved 2012-08-08. ^ Dead link at Crisis Management Initiative website: "Archived copy". Archived from the original on 9 May 2013. Retrieved 2008-10-10. CS1 maint: Archived copy as title (link). Wikimedia Commons has media related to Martti Ahtisaari.